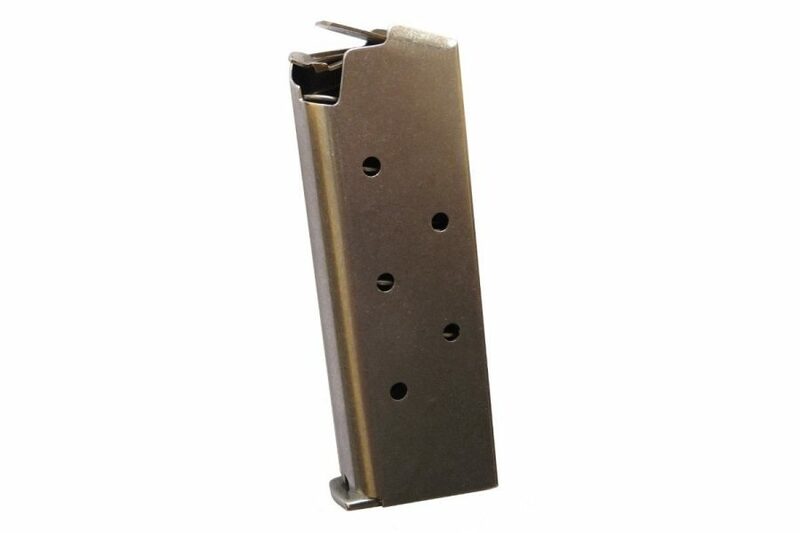 Adds a round to your 7 round Sig Sauer P238 .380 caliber magazine without adding extension. Internal OEM components are replaced with MagGuts™ components. This conversion uses our Hybrid Spring System. The Hybrid Spring System is the latest in magazine spring technology developed by us for use exclusively in our MagGuts™ products. 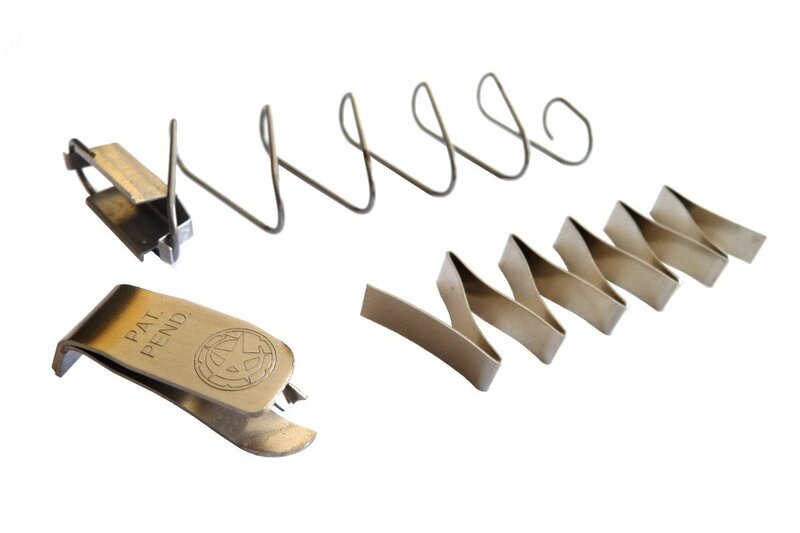 It uses one wire spring and one flat spring in combination to deliver unmatched force density for your magazine. -Retains exact size and feel of original pistol since size does not change. -Maintains slide lock and feed reliability. -Patented, U.S. Patent Nos. 9,170,062 and 8,819,977, other patents pending. Worked in my flush 6 round magazine, so I bought two more, converting my 7 rounders to 8 rounds each. Sixteen rounds of 380 on me in a small package! Easy to install I’m no gunsmith so doing any mods at all is a big deal for me. These were truly simple to install. Best damn directions I’ve had to read and follow. Haven’t fired yet but can’t wait to check action. Works as advertised , improves a small pistol with 1 more round. Worked as advertised. Good service. Quick delivery. I bought four MagGuts “+1” kits for my Sig P238. In a function test, they all performed without failure of any type, with both FMJ and Hornady XTP bullets. No FTE, no FTF. The only issue I had with the product was the skimpiness of the instructions. I recommend the buyer find a good YouTube video on the subject. Also, the buyer should be aware that the new follower is to be fitted in what looks to be a backward orientation compared to the factory follower. Extremely easy to install. Well made and works as required. I used them for SIG p238 original magazines in both, six round flush and seven round extended. Being an engineer, I appreciate the design, function and simplicity. Wish I came up with that! I value that extra round. My wife’s Sig P239 now has 9 rounds! 7 round mag is now 8 , pus one in the chamber. If she needs more than that, she bit off more than she should have. Recent order arrived 2 days after purchase. I also had to switch a purchase of 9mm inserts for 389acp inserts. Pkgs were unopened. They answered my inquiry about the switch in 24hrs and handle the swap with speed and without complaints. I will be making my future buys with MG.
Bought it for my Sig P238, 1 out 3 times the last shell would not move up causing the pistol to lock back the slide like it was empty. Only to find one more round in the mag. In my opinion if it fails once it should be a one star rating. I’m not even going to try the 6 round Mag. The kit was easy to install & works great. I can now hold 8 rounds in the 7 round mag, w/o adding any length. Work as designed. I am very happy. Very pleased with magguts products. bought this for my seven round factory mag and when i was finished still had a seven round mag. reinstalled it three times and same result . This conversion works well, although the orientation for assembly is subtle, even after watching the video. Even with one assembly/reassembly cycle it only took 20 minutes. My Sig is now an 8+1. Awesome!! It works but. The follower shoulder is too short, on the front end. If not carefull when loading the first cartrige. The follower will flip out of the magazine. The front shoulder needs to be a little longer, so it will stay in the mag on the first round loaded. These are sig mags’. I have double checked my assembly. Also I have only cycled a full mag by hand. The first 2 times I had a cartrige feed during extraction. It seems to be ok now. Im waiting on some range cartriges delivery so, I can try it out under firing condition. I will let you know how that works out. If you solve the follower issue. I would apreciate you sending me the replacment follower. As for the Glock 43 mags. Hand cycling is good. Havent’ been to the range yet. I will have to get back to you, after the trip to the range. Both the Sig and Glock are fairly new pistols. With about 50 rounds fired thru each one. Before the Mag-Guts install. didn’t buy for the sig saucer got the kit to convert my springfield 911 mag conversion and worked perfectly. A little tricky to install in this particular pistol, but it works well. It was real tight getting the last round in at first, but I let it sit with a full magazine for a few days, and it worked out well. Well like the title says I used the mag conversion for the Sig P238 in my Kimber Micro .380 and it works perfectly. The instructions were easy to follow, (on Kimber mags you can skip the pencil and hex key trick, just slide the bottom off and remove spring and follower then slide the bottom back on and proceed with instructions). I installed the MagGuts in a 6 & 7 rd mag with no problems. Gun cycles and locks out at the end. Very happy with the conversion and very happy about carrying 2 extra rounds on me. The first time assembling I did not get the cup in right and on feeding only 7 rounds, took apart, was very careful the second Time & it worked. Trick is follow the instruction very carefully. A llittle difficult to install but once done works as described. Will be purchasing more. Simple to install. Works great both in my P238 and Shield 9 mm. I have used magguts products in a number of different pistols I’ve never had a problem with any of them. Add to that fast shipping, it’s a winning purchase. My P238 7 round mag now carries 8 round while maintaining my carry gun’s height. I like the product a lot! Second platform I’ve used these on, I’m a happy camper. My only tip is that these are harder to install due to the 1911 style magazines. Some of my mags didn’t accept an additional round, but reassembly fixed that. Go slowly, and keep the mag upside down like the instructions say! Great product. This one I’m using in a Springfield 911 380. The magazines are interchangeable with the SIG P238. Viewed video and install was easy. One worked good. One only took 7 rounds after the conversion. Had to redo it multiple times before it would take 8 rounds. Not sure why as I followed the directions to the letter. Worked great. Paid attention to the instruction and there were no issues. YouTube video helped as well. Thank you! Cash ship, easy to install and worked great! The Sig Sauer P238 and the Springfield Armory 911 (both in .380) are virtually identical. Even the standard, out of the box magazines for these guns can be interchanged, and to no surprise, so can the MagGuts. I purchased the Sig Sauer “Guts” for three 7 round magazines and one 6 rounder and this increased each mag by one round for my Springfield 911. They worked perfectly and also held the slide open after the last round was ejected. After approximately 150 rounds through my four magazines without a failure I just have to give these replacement springs two thumbs up! I would also respectfully suggest that the engineers at MagGuts test this for themselves and then consider adding the Springfield 911 to their catalog. Install their seven round kit into a Springfield 911 extended mag for my sig 238 and now I have 8 rounds plus 1 totaling 9 in my carry. Haven’t had one failure to feed in 500 rounds. I would purchase again. Ordered 2 conversion kits for 6 rd Mags, and 1 for 7 rd mag. 6 rd conversion kits worked successfully on a sig, and kimber Mags. Haven’t tried converting the 7 rd mag yet, but I’m already happy based on the 2 I’ve converted so far.